While the main features of Messenger Payments can be easily access from your Tiles (Homepage), you will also be able to navigate all features via the Menu, located in the top right corner of every page in the Messenger Payments interface. Click the first option from the Menu to view school name and update Ledger Codes. From the School Profile page, click Actions then Costs Centres/Ledge Codes. 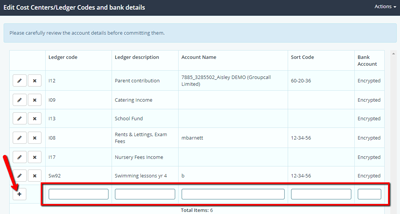 To add a new Ledger Code, enter all of required information into the blank row at the bottom of the list of current codes, then click the plus icon. View a list of all activities and create new ones. 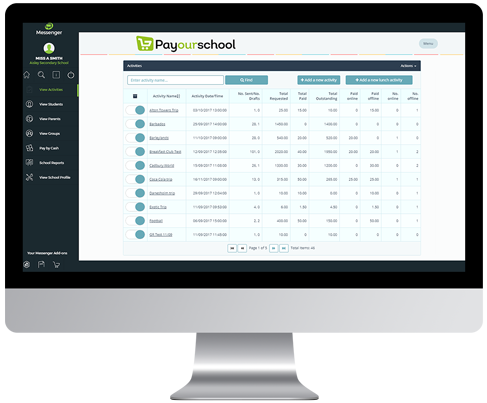 Search for individual students to view their details, activities and transactions. Search for individual parents to view their details, activities, transactions and parent URLs. View full list of students for individual classes or groups. Update information for students that have paid for an activity with cash or cheque (rather than through Messenger Forms). Access Messenger Payments report features.